When springtime starts with sloppy mud, gray skies, and tepid weather, it’s hard to get excited about the season. No sound is better able to pierce this wet blanket than the ringing konk-la-ree call of a red-winged blackbird with its thrilling trill at the end. I’ve heard it everywhere lately, from a lakeside bike ride to my walk from car to office. Red-winged blackbirds are year-round residents in much of their range, which stretches from the Yukon down to the Yucatan. The northern breeders, though, must migrate far enough south to find crop stubble with waste grain and weed seeds not buried by snow. They gather in large flocks of as many as several million birds, and fly up to 50 miles each day from the roost to foraging grounds. While the flocks of males currently foraging in yards and under bird feeders are not on territories yet, they already singing loudly—warming up for the big show. Drab, brown females will follow later, after insects begin to hatch. The ladies need a high-protein, high-calcium diet to prepare for egg laying, and have no reason to risk getting caught in a blizzard. Once they arrive, females will choose a male’s territory, and set up a smaller territory within it. As many as 15 females might nest in a single male’s territory, but the average is five. Nests are built low to the ground, and are suspended among some upright stems of marsh plants. Females wind stringy plant material, wet leaves, and decayed wood into a bowl, and the line it with soft, dry grass. This habitat requires a couple special adaptations. The most visible is the brown-streaked plumage of the females—perfect for staying camouflaged in the thickets. Those feathers are also extra sturdy, because living among rough cattail stems could result in undue wear and tear. In addition, both sexes have sturdy leg muscles that allow them to perch with each foot on a different cattail and do the splits. Red-winged blackbirds also have long digestive tracks, which allow them to eat a wide variety of foods. In the summer, though, when their diet focuses on insects, their gizzards will shrink, only to get more muscular again when late summer seeds become ripe. Late summer seems worlds away, though, as snow falls in the mud puddles and weed seeds get re-buried. The migrating flocks of red-winged blackbirds must be on the move again, looking for spring. When they find it, we can be sure they’ll sing a ringing konk-la-ree to let us know. For over 45 years, the Cable Natural History Museum has served to connect you to the Northwoods. Come visit us in Cable, WI! Our new phenology exhibit: “Nature’s Calendar: Signs of the Seasons” will open May 1, 2016. 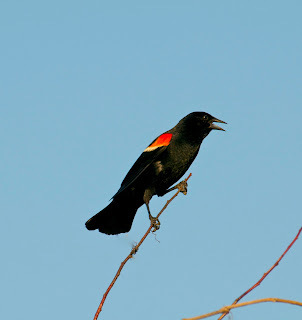 Red-winged blackbirds are an early spring migrant, and pierce even gloomy days with their ringing call. Photo by Larry Stone. During the fickle days of early spring, my emotions seem to rise and fall in sync with sap in the maple trees. I get kind of grumpy when the mornings dawn damp and cool and the tracks on the ski trails sink dejectedly into the slush. After the extended ski seasons of the past two years, I’ve gotten accustomed to having endless days to explore new trails and perfect technique. My feelings change as the days brighten, intense sun takes over, and the temperature spikes. Warm breezes and dry roads make me eager to put away the skis, and happy to pull my road bike out of storage. I guess you could say that I’m running hot and cold for spring. The first place I head on my inaugural spring bike ride is to a little wetland across the county road from Lake Namakagon. This wetland tends to thaw a bit sooner than the one by my house and it is consistently the first place I hear the spring chorus of frogs. The eleven species of Wisconsin frogs (and one species of toad) wake up and begin singing their songs in a typical order each spring. Their specific phenological timelines depend on things like overwintering location, cold tolerance, and breeding habitat. Our three earliest singers share some common characteristics. Wood frogs, chorus frogs, and spring peepers are all somewhat terrestrial frogs that spend the winter as frogcicles, buried lightly in duff on the forest floor. Spring sun and warm rains can reach them quickly here, and they are triggered to thaw, wake up next door to their honeymoon suites, and breed very early in the season. April is typically their main month of romance, but each spring progresses a little differently. By getting such an early start, these frogs are able to carry out their entire breeding cycle in vernal pools. These woodland puddles only persist for a few months each spring. This means that eggs and tadpoles don’t have to worry about the fishy predators who would live in a permanent body of water, but it also means that the parents need to hurry up and get their babies growing so that they can gain legs before the pool dries up. Of course, spending winter on land has its own challenges. Even though the subnivean layer—where snow meets earth—remains warmer than the television weather report, frogs in the duff must still endure below-freezing temperature for many days at a time. They do this not by avoiding the frogcicle state, but by guiding it. Wood frogs are the most highly studied, but spring peepers and chorus frogs use similar techniques. 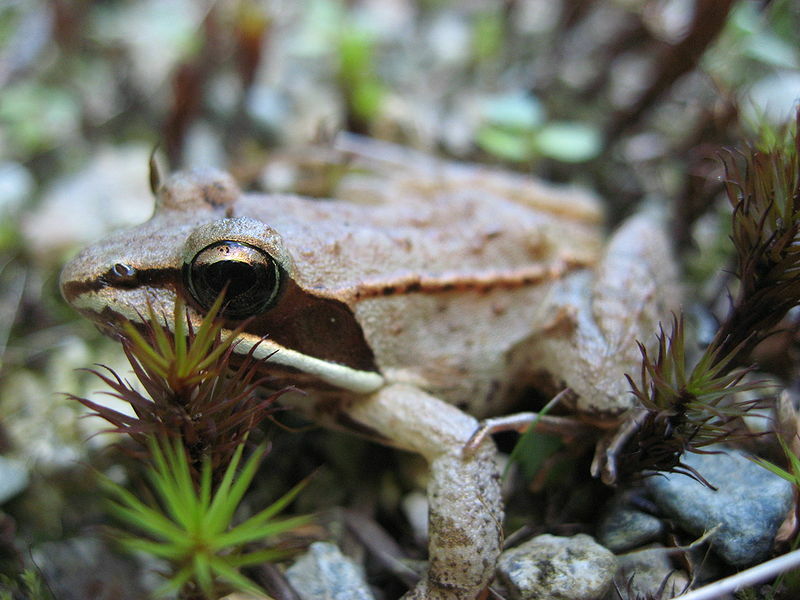 The process starts early in fall, when wood frogs begin accumulating urea in their tissues. While urea is a waste product that humans excrete in our urine, urea is also a cryoprotectant, or a substance used to protect biological tissue from freezing damage. Then, when the temperatures dip below 32 degrees Fahrenheit, ice crystals start to form on the frog’s skin. Some animals are able to “supercool” or prevent the formation of ice even when temps dip below freezing. This usually requires them to avoid contact with ice that would trigger flash freezing. Frogs, with their permeable skin, just allow the frost to set events in motion. Ice formation causes the frog’s liver to convert stored glycogen into glucose. The sugar floods throughout the frog’s body, carried in its bloodstream by a heart that keeps beating as long as possible. As ice forms outside of cells, it locks up the pure water, and leaves behind a higher concentration of salts and other things that were previously dissolved in the liquid. Water from inside the cells wants to flow outward, across the cell membrane, to even out the imbalanced concentrations. This could dangerously dehydrate the cells, though, and there is a threat of them collapsing. Glucose and urea help the cells retain water in two ways. First, sugar water freezes as a lower temperature than plain water, and so less ice forms overall. Second, by increasing the concentration of chemicals inside the cell, it keeps water from wanting to flow out of the cell under osmotic pressure. While frozen, the frogs are essentially dead. Once spring comes, however, wood frogs thaw from the inside out. The heart starts beating (scientists still don’t know what jumpstarts it), the brain wakes up, and finally legs move. And those legs will carry them directly to a nearby vernal pool. A deafening chorus of love songs ensues, and mating commences in a hurry. Wood frogs quack, spring peepers jingle like bells, and chorus frogs imitate a finger plinking a plastic comb. That’s what I was hoping for today, but the wetland was still quietly blanketed in snow. Over the winter, the frogs may undergo multiple freeze-thaw cycles. Springtime warmth also ebbs and flows. And then there’s me, sometimes turning a chilly shoulder to our next season, and sometimes embracing it with an open sweater. I guess I’m not the only who runs hots and cold! Wood frogs are hardy winter hibernators and early spring singers. You can identify this small brown frog by the black bandit mask across its eyes. Photo by Michael Zahniser, Wikimedia Commons. A dozen adults hunched over tables examining bare twigs with borrowed hand lenses. Back and forth they looked, between the dichotomous key and their specimen. Did it have one or three bud scales? Or more than five bud scales? Was the pith of the twig chambered or solid or hollow? Finally, we arrived at an answer: the smooth, gray twigs with plump, red buds (covered by three bud scales) belonged to a basswood tree. For fun, I had the students each nip off a bud with their teeth and experience the slightly sweet flavor and mucilaginous texture of this wild edible. We practiced keying out a few more twigs, and then the winter tree identification class headed eagerly out into the warm sunshine to walk the trails at the Northern Great Lakes Visitor Center in Ashland, Wisconsin. We sniffed the glossy, aromatic buds of balsam poplar, admired the snazzy, scarlet stems of red osier dogwood, and commented on the stalked buds of speckled alder. Identifying woody plants by their winter twigs is one of my favorite challenges, and I hoped that the students would gain an appreciation for it, too. As I drove home on Highway 2, a dark blob high in a roadside tree caught my eye. One quick glance backward confirmed my suspicion. The blob showed a spikey outline against the evening sky. Porcupines have begun their spring feast! If you want to meet a real expert in winter tree identification, be sure to bring a thick leather glove for shaking their paw. Porcupines survive on low-nutrient bark all winter long, and the lengthening days of spring bring a welcome change in their diet. A few years ago I started noticing that in late winter these bristly roadside silhouettes start appearing with some regularity. As it turns out, porcupines spend their spring eating a rotating smorgasbord of juicy tidbits, and they time their courses to match the period when each entree is the most nutritious. They know their trees well because their life depends on it. Dr. Uldis Roze, professor emeritus at City University of New York, radio-collared a porcupine he named Rachel, and followed her around the Catskills one spring. By testing the chemical content of the buds and leaves while Rachel fed on them and then analyzing the plants again after she ceased to eat them, Roze discovered that Rachel pinpointed plant parts high in protein and low in toxins. To get at the most nutritious parts of a twig, porcupines will balance out toward the terminus of a branch and nip off its end using their self-sharpening incisors. Turning the wand around, they nibble off all the most tender twig tips and buds and then discard the rest. Trees on sunny roadsides may be further along in their seasonal sequence than their relatives in a shady forest, so porkies are extra visible now as they satisfy their hunger for spring. 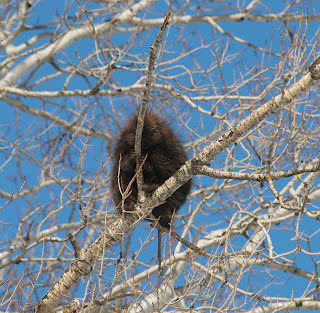 Sugar maple buds are one of porcupines’ first spring snacks. As sap rises, the buds swell. Packed inside the overlapping layers of toffee-colored bud scales, tiny leaves and twigs begin to expand. Their chemistry changes, too. At the height of their nutrition (which happens just as the syruping season ceases), sugar maple buds have more protein than enriched breakfast cereal. After just a few weeks, once the buds have fully released their tender young leaves, porcupines cease their sugar snacking totally. The protein content might still be the same, but it no longer matters. The tree has now fortified its appendages with toxic tannins. Tannins are chemicals that bind with proteins, making them an effective defense against many types of herbivores. Sugar maple’s close cousin, the red maple, defends its buds, twigs, and leaves with tannins year-round. It doesn’t seem to have a place in the porcupine’s buffet. Instead, the sweet basswood buds that the students tasted are a porcupine delicacy, as are expanding aspen and willow catkins. Ash trees are the last to open their buds, and they also represent that last of the spring smorgasbord. Once the juicy expanding packets of ash leaves get too old, porcupines switch to a diet of ground plants for a couple months. When the dandelions, clover, and raspberries dry out, porkies head back up into the trees and return to their winter diet of tree bark and evergreen needles. Phenology is the study of when specific events happen in nature from year to year in a specific place. Each tree species has its own place in nature’s calendar. Porcupines follow this schedule closely, since each species has an optimum nutritional stage. Amazingly, porcupines are active mostly at night, and so identify their next meal by bud and twig under the cover of darkness. Perhaps my next tree identification workshop should include a pricklier instructor! 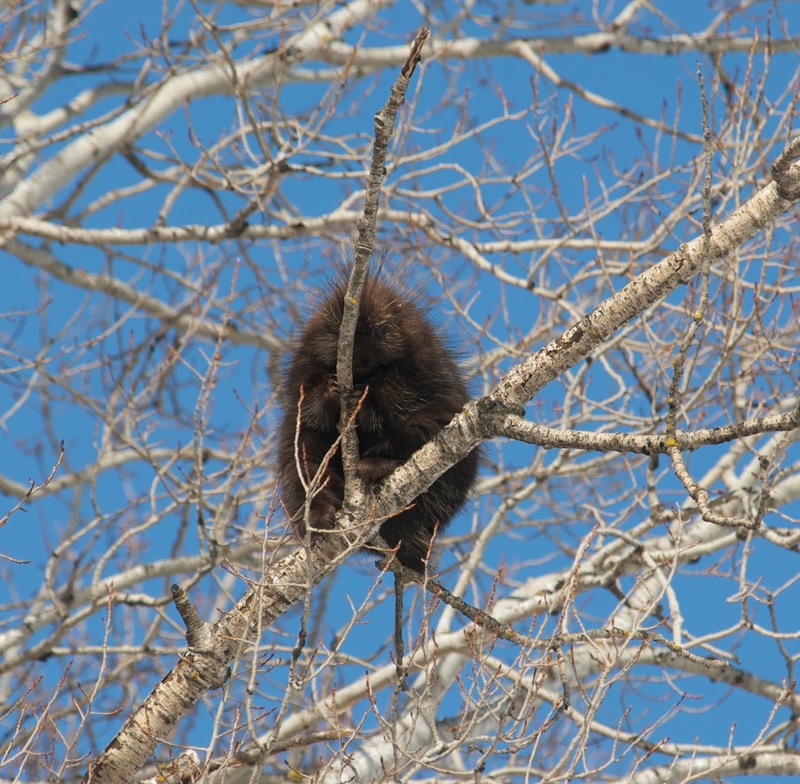 Porcupines are especially visible in spring as they dine on a smorgasbord of tasty tree buds. Photo by Larry Stone. I could not believe the traffic on my driveway this morning. The woods were suspiciously quiet by the time I strolled along it, but the light dusting of fresh snow recorded the secrets of a busy night. Red fox tracks—about two inches long and sporting claw marks—trotted evenly down the north side of the tire tracks. I followed them absentmindedly through the brisk wind and strengthening sunshine. At the road intersection, I found the loping 1-2-1 track groups of a fisher. One front paw landed first, by itself in the back of the group (1). Then the other front paw and one hind paw landed side-by-side in the middle (2). Finally, the last hind paw left a single track at the front of the group (1). The dusting of snow atop a firmly packed snowshoe trail made a perfect tracking canvass. Each of the five naily toes registered clearly, and along with the track pattern, gave away the fisher’s identity. On my way back in, I was startled to see another line of two inch long tracks, each with a slightly different shape than the fox’s. While the fox’s toes were arranged symmetrically, and its interdigital pad was roughly triangular, these other tracks seemed slightly askew. Rounded toes—lacking claw marks—formed an off-kilter half-circle in front of a lobed pad. I wasn’t surprised to see these bobcat tracks, since we’ve seen the actual bobcat for three mornings in a row. Yesterday, the cat tracks emerged from under my car! My housemate spotted it later on the road. Three days ago we watched the bobcat trot down the driveway, and I later tracked it for close to a mile. I often notice an increase in tracks this time of year. Perhaps it’s because I’m out in the woods more—enjoying the longer days, warmer weather, and firm base of snow. But I suspect that animals themselves are more active, too, and for some of the same reasons. Plus, this late winter/early spring season is when many animals start traveling more widely in search of mates. For animals in the Northwoods, the timing of reproduction must find a delicate balance between missing the last snowstorms and cold snaps, while still having enough time to grow and be ready for the next round of winter weather. Red foxes are no exception. In Wisconsin, they tend to breed in January and February and have their pups in March. Males stick around to help care for the young, and a pair will often defend its territory together all winter. I’ve only seen the tracks of a single fox, though, and no musky-smelling scent marks that typically define a territory. Perhaps this fox is lonely and still looking. The fisher tracks out by the road were solo, too, but that’s not as surprising, based on their breeding system. Male and female fishers don’t socialize throughout the year. The males defend a large territory, often encompassing the range of more than one female. Once a year, around this time, they come together just to mate. Nothing happens right away, though. Once fertilized, a blastocyst (the precursor to an embryo) just hangs out for 10 months. Active pregnancy finally begins in mid-February of the following year. About 50 days later the kits are born. A week after giving birth, the female comes into estrus and the breeding cycle begins again. Not only are fishers restless from hormones right now, they also enjoy the relative ease of travel on late winter’s crusty snow. One research study found that they become homebodies when deep, soft snow makes travel difficult. Bobcats are also solitary throughout most of the year, except when they come together to mate in February and March. Males tend to have larger territories of about 25 square miles that overlap with more than one female’s smaller ranges. If my new neighbor is wandering in search of a mate, I might get to hear the yowls, screams, and hisses they use during courtship. Both males and females might mate with more than one partner, and the female raises her kits alone. As the busy traffic in my driveway shows, late winter is a great time to start planning for the babes of spring. Now, if you’ll excuse me, I have some tomato seeds that need planting. For over 45 years, the Cable Natural History Museum has served to connect you to the Northwoods. Come visit us in Cable, WI! Our new exhibit: “Lake Alive!” opened May 1, 2015, and will remain open until March 2016. The rounded, clawless toes and off-center arrangement of bobcat tracks make them distinctive. Bobcats are out and active, searching for mates, during February and March. Photo by Emily Stone.